The WOA business model is a vertically integrated food and agriculture company comprising land assets, protected cropping and our food brand, Food for ReasonsTM. We are seeking strong, sustainable financial returns and are committed to making a positive impact on the communities and ecosystems in which we operate. We are focused on improving biodiversity, enhancing soil health and creating new jobs and enterprises in Western Australia’s Wheatbelt. We want to become the world’s first listed company to deliver 4 Returns. WOA Chairman Anthony Maslin, Managing Director Dr. Ben Cole and non-executive Director Stuart McAlpine will be conducting IPO Investor Presentations across the Wheatbelt and Australia in April and May 2018. We hope as many local and global investors as possible choose to participate in the Offer. We believe that real change comes through people coming together and striving for a better world. Buying shares in WOA is a statement of your belief that regenerative, diversified farming systems can deliver great outcomes. WOA’s incredible journey now hits Perth kicking off with an event at Scarborough’s The Art Space Collective tonight! Tomorrow, we’re at Fremantle’s PS Art Space with Guest Speaker, the honorable Alannah MacTiernan! Thanks Minister. Thursday we’re at Perth City Farm Another fantastic venue! ...where you can also download your prospectus and apply for shares! The return of new hope and inspiration to people and places that need it most! SMS executes pivotal Aircraft Component Purchase (“ACP”) Agreement with Delta Air Lines, Inc. Structural Monitoring Systems plc (“SMS” or “the Company”) (ASX: SMN) is extremely pleased to announce that it has executed the world’s first commercial agreement related to the supply and permitted use of a structural health monitoring (“SHM”) technology with a commercial airline operator. SMS and Delta Air Lines, Inc. (“Delta”), have formalised a critical, strategic commercial relationship through the execution of an Aircraft Component Purchase (“ACP”) Agreement (“the Agreement”). A major global carrier’s adoption and fleet-wide installation of CVM™ technology, would lead the global commercial aviation sector to full, widespread use of CVM™ products. Subsequent sales of CVM™-related equipment to the world’s remaining airline carrier fleets would be expected to generate revenues that are many multiples higher than those revenues generated with Delta - and this excludes the per annum revenue value that would be derived from annual, continuously renewable CVM™ technology licensing agreements. The commercial value of technology license agreements will ultimately peak at approximately $US10-15 million, on a per annum/per operator basis, for a typical Tier I airline operator. “We are extremely pleased to have now executed what is undoubtedly the world’s most significant Agreement in the burgeoning field of Structural Health Monitoring with Delta Air Lines. “We have worked with Delta for a long time to finally achieve this extremely important “company-making” milestone Agreement. As SMS has matured into a progressive and rapidly evolving technology company, we are extremely fortunate to have such a high-profile, commercially powerful and globally-recognised partner to accelerate CVM™ into the commercial realm. “SMS has now well and truly “arrived”, and the Company enjoys a very visible, and substantial, “first-mover” advantage coupled with a unique and highly disruptive technology; we intend to exploit these clear commercial advantages to their fullest. “I would like to sincerely thank all of our team at SMS and AEM, and all related personnel from Delta, Sandia Labs, and other contributing organisations, for their focus and efforts. We now look forward to realising CVM™’s true commercial potential in the global civilian aerospace arena, and creating a demonstrably valuable business for SMS shareholders, and for our friends and colleagues at Delta, who join us as a highly regarded, and valued, strategic partner. and commitment to, SMS’s CVM™ technology as the clear industry leader in this game-changing field. We look forward to a close and highly productive association for years to come”. into current aircraft maintenance environments. As a result, CVM™ is currently the most commercially-ready technology, and the only Structural Health Monitoring (“SHM”) solution that has a demonstrated, advanced Technology Readiness Level of 9, indicating it is industry-proven and ready for deployment. “The CVM™ technology has moved through multiple review and approval processes and is the first SHM method to achieve approval for routine use on commercial aircraft. Critically, as multiple aircraft manufacturers move through their final stages of technology validation, CVM™ holds a significant “market leader” position, and embodies tremendous promise for in-situ monitoring of all aircraft types, as well as other structures in numerous industries beyond aerospace. All staff at SMS, and AEM, are looking forward to the months ahead as we work towards executing the multiple commercial platform opportunities provided through the new relationship with Delta – as well as those that will develop through the new strategic relationships that this alliance will foster. The Company also looks forward to the continued development and execution of all SMS’s valuable legacy programmes in the civil aerospace, military and rotor-craft sectors. The Company will host an investor conference call to be held Wednesday, August 23rd, 2017 at 11.00am AEST. Call details and format will be updated via separate forthcoming ASX announcement. Buxton Resources Limited (ASX: BUX & BUXO) is pleased to provide an update on exploration completed at the Double Magic project since mid July. Work is ongoing. Drilling at Merlin is progressing steadily, with nearly half of planned holes completed. Step-out results are strongly positive confirming mostly disseminated, persistent, visible Ni-Cu sulphide mineralisation along strike and down-dip from the 2015 discovery holes at Conductor D. Buxton advises readers that sulphides can be visible in trace amounts or greater. Drilling has now tested approximately 1,500 metres of strike extent and over 500 metres of dip extent at Merlin, with visible sulphide mineralisation in multiple horizons still open in all directions. See Figure 1 for the current drillhole location plan. Significantly, a second mineralised horizon within the same Ruins Dolerite package has been identified about 100m below the first zone discovered in 2015. Some holes have now intersected three or more discrete zones of visible sulphides within a range of rock-types, highlighting the complexity to be expected within multi-phase mafic-ultramafic intrusive bodies such as the Ruins Dolerite. 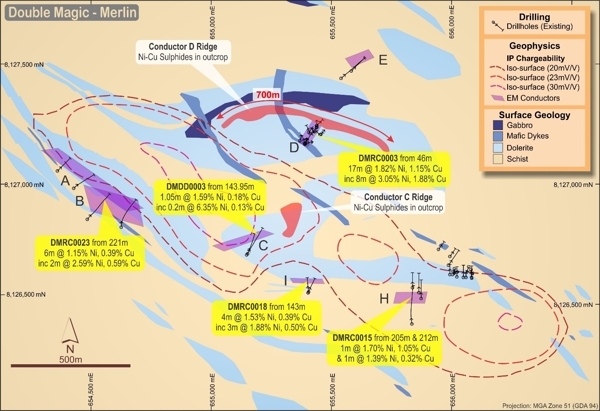 The pervasive nature of sulphide mineralisation being discovered at Merlin is best illustrated by the fact that of the 13 holes drilled so far in 2017, all but one have intersected visible sulphides, all within rocks assigned to the Ruins Dolerite, predominantly meta-dolerite and meta-pyroxenite, the latter with characteristics of a cumulate rock, a very positive genetic indicator in systems such as these. Sulphides are typically fine to coarse disseminated pyrrhotite and chalcopyrite, with pentlandite and pyrite also likely to be present (assays pending). Heavily disseminated zones of interstitial (interpreted to be magmatic) sulphides occur for example in DMDD0006, 100m down dip from 2015 discovery holes at Conductor D, with 9.5m of strongly disseminated to weakly net textured sulphides from 106m down-hole (see Figure 2). Some of the remobilisation of sulphides noted in chips and particularly core may reflect later-stage magmatic activity related to primary mineralisation, while in other areas higher-level hydrothermal processes likely unrelated to primary mineralisation, are clearly evident. Two RC holes and one diamond hole have been drilled through the two main >30mV/V Induced Polarisation chargeability isoshells, two holes (DMRC0026, DMDD0005) in the main western anomaly and one hole (DMRC0030) in a second isoshell to the south-east of Jack’s Hill. None of these holes intersected anything observable in chips or core which could account for the IP anomaly, however the two western holes continued to depth testing geological targets. Both subsequently intersected sulphides within Ruins Dolerite well below the chargeability anomaly. Down-hole chargeability and benchtop testwork will be completed within coming weeks to determine the source of the chargeability anomaly. For details of drillhole locations and a summary of visible sulphide intersections greater than 5 metres in down-hole length, see Tables 2 and 3 at the end of this document. For the general location of Buxton’s Double Magic project, see Figure 3 also at the end of this document. Wireline Services Group is currently enroute to site to complete the first round of high-power down-hole TEM (DHTEM) surveys on all holes drilled to date. All holes will also be gyro-surveyed, with other electrical logging to be trialled on selected holes. Results are expected over the next 2-3 weeks. Buxton considers DHTEM an essential targeting tool at Merlin, with timely receipt of results during drilling a critical success factor. Several batches of samples are being freighted to Perth for laboratory analysis. Results are expected within 3 to 4 weeks. Buxton has received results from preliminary metallurgical testwork conducted on selected diamond drill core from 2015 holes DMDD0001 and DMDD0003. Three 12 kg core samples grading 1.82% Ni, 3.17% Ni and 0.55% Ni respectively were submitted for batch froth flotation analysis by ALS laboratory in Perth. Results are outstanding with excellent recoveries from the relatively course grind size of 106µm (0.106mm). Grind power requirements appear typical of WA nickel operations. Upside is considered likely on all these results as the test regime applied was a standard, non-optimised “sighting” process. Further metallurgical work will be undertaken later this year. See Table 1 for full results. During July Ecologica Environment completed an inaugural flora and fauna survey around the Merlin area. This survey was an “end of Wet season” baseline survey undertaken by a botanist and a zoologist, and was focused on identification of various flora and fauna within the project area. Figure 3 – Location of the Double Magic Ni-Cu Project in Western Australia. Also shown is the location of Panoramic’s Savannah Ni-Cu Mine. The information in this report that relates to Exploration Results is based on information compiled by Mr Rolf Forster, Member of the Australasian Institute of Mining and Metallurgy, and Mr Eamon Hannon, Fellow of the Australasian Institute of Mining and Metallurgy. Mr Forster is an Independent Consultant to Buxton Resources Limited and Mr Hannon is an employee and Director. Mr Forster and Mr Hannon have sufficient experience which is relevant to the activity being undertaken to qualify as a “Competent Person”, as defined in the 2012 edition of the Joint Ore Reserves Committee (JORC) Australasian Code for Reporting of Exploration Results, Mineral Resources and Ore Reserves. Mr Forster and Mr Hannon consent to the inclusion in this report of the matters based on the information in the form and context in which it appears. Buxton Resources Limited (ASX: BUX) is pleased to advise that the Reverse Circulation (RC) drill rig and crew has arrived and established safely onsite at the Double Magic project, Merlin prospect. RC drilling commenced yesterday, 9th July 2017. An HQ diamond core drilling rig is scheduled to be on site and drilling later this week. For location of the Double Magic project, see Figure 1 at the end of this announcement. Buxton’s 2015 discovery of high-grade primary magmatic nickel-copper sulphides at Double Magic (Merlin prospect) confirmed better than economic grades and thicknesses for the first time in the region. Widespread, near-surface >1% Ni sulphide mineralisation was intersected, with >3% Ni assays returned from three separate targets within the 3 km2 Merlin prospect (ASX 27/11/15). This marked a historic turning point for mineral exploration in the West Kimberley. 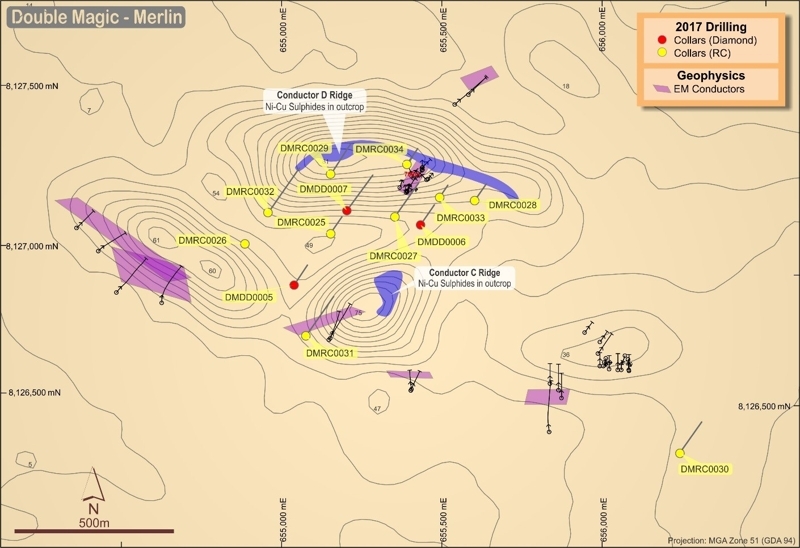 The first two phases of drilling at Merlin were completed by September 2015. During 2016 Buxton de-risked future drilling by completing extensive further technical work and specialist studies, notably including an innovative high power pseudo-3D Induced Polarisation (IP) survey (ASX 24/10/16). Testing deeper or conceptual geological and geophysical targets, including the large IP chargeability anomaly identified by Buxton in 2016. 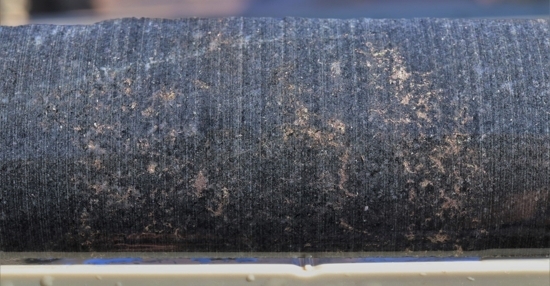 Importantly, all EM conductors (airborne, surface and down-hole) drill tested to date at Merlin have proven to be related to nickel-copper sulphide mineralisation. Two 2015 holes also clipped the edge of the 2016 IP chargeability anomaly, these holes also intersected disseminated, magmatic Ni-Cu sulphides in prospective igneous mafic rocks. Coupled with sulphide mineralisation in outcrop in two locations and the numerous, widespread high-grade Ni-Cu intersections in 2015 drilling (see Figure 2 below), Buxton is confident that the Merlin prospect represents a large, previously unknown magmatic Ni-Cu sulphide system. The 2017 program beginning now is designed to explore within that system. As a routine part of the drill program, gyro surveys will be conducted on all holes as well as high-power down-hole TEM (DHTEM) surveys. Drill samples will be submitted routinely in batches to laboratories in Perth. Significant assay results will be reported as they come to hand. Additional market updates will also be issued as required. As part of mapping and sampling completed during June at the Fireant prospect 15km to the east, several geophysical (VTEM) drill targets were upgraded in prospectivity. Large volumes of prospective igneous mafic rocks have now been outlined at Fireant. Traces of fine disseminated sulphides were seen in rocks prospective for magmatic sulphide systems, updip of several modelled VTEM conductor plates. A seventh combined geological and geophysical target was also added to the initial six Fireant conductors selected for drill testing, planned to be one initial hole per target. Buxton looks forward to updating investors again soon during this exciting stage of work at Double Magic. 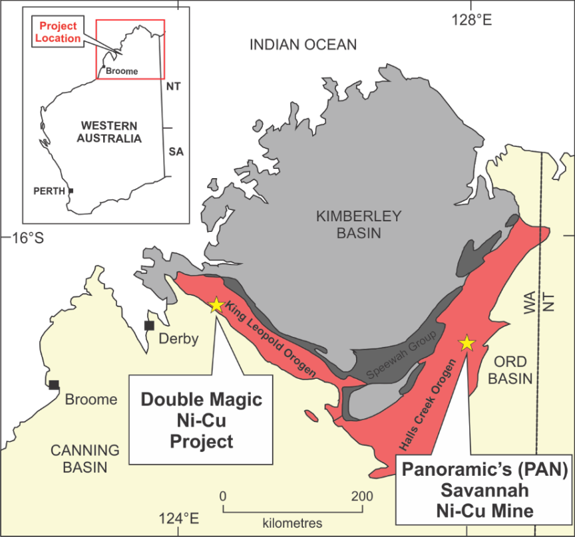 Figure 1 – Location of the Double Magic Ni-Cu Project in Western Australia. Also shown is the location of Panoramic’s Savannah Ni-Cu Mine. PharmAust Limited (“PharmAust”) (ASX: PAA) is pleased to report that the first canine with cancer has been recruited for the study and has started treatment with MPL capsules at the University of Cambridge, Department of Veterinary Sciences, The dog in question is suffering from metastatic mammary cancer. The primary objective of the trial is to examine the effects of reformulated MPL capsules in different canine cancers with the aim of determining which cancers should be targeted in Phase III. The canines in this study will have failed “standard of care” and will have few or no therapeutic options available. The Phase I canine trial undertaken in 2014/2015 showed excellent safety with suppression of tumour markers and the current Phase II is intended to build on these successful earlier results by including determinations of regression, stable disease or progression by measurement of tumour size. The ease with which owners can administer MPL capsules will also be an important factor in the trial as the initial phase I trial was limited by palatability issues of the drug, which led to the development and manufacture of the capsules. As MPL is already approved for veterinary use by PharmAust’s partner, Novartis Animal Health, we believe that if successful in this trial, MPL will be able to be approved quickly for the treatment of dog cancers following a further pivotal study. We look forward to reporting progress when further animals are recruited and treated.